Tim Kaine: Democratic vice presidential candidate Tim Kaine voted at 6 a.m. and did a round of national morning TV shows. 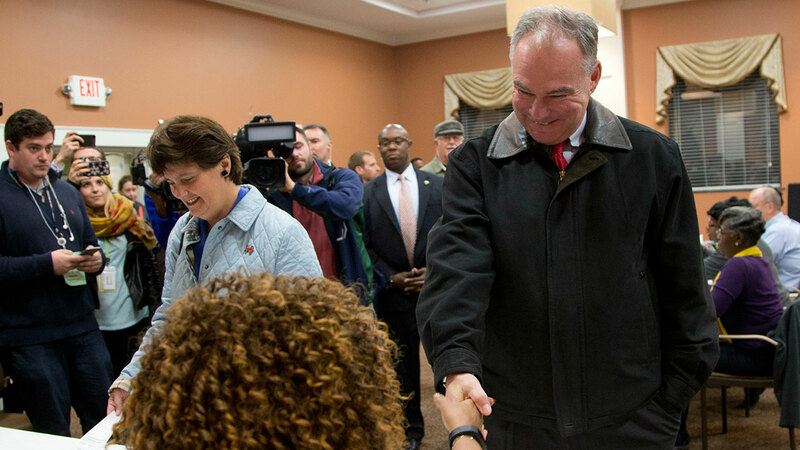 Then Kaine met a group of friends for breakfast at the City Diner in Richmond, Va. Kaine and his friends try to meet every Tuesday at the diner, a few miles from his home. He was greeted with cheers as he walked into the restaurant. Hillary Clinton: Democratic presidential nominee Hillary and Bill Clinton voted in their hometown of Chappaqua, N.Y. The Clintons greeted supporters waiting outside the polling place after casting their ballots Tuesday morning. She said it was "the most humbling feeling" to vote "because so many people are counting on the outcome of this election." Bill Clinton said he's eager to be a political spouse, joking that he had "15 years of practice." Donald Trump: Republican presidential nominee Donald Trump voted in Midtown in New York City. Hundreds of onlookers watched as Trump, his wife Melania, daughter Ivanka, and son-in-law Jared arrived Tuesday morning at their polling place at a public school on Manhattan's East Side. "It's a great honor, a tremendous honor" to be casting his ballot, he said. He said he's feeling confident about the outcome, citing "tremendous enthusiasm." As for his longstanding concerns about voter fraud, he says. "We're always concerned about that." His final message to voters: "Make America great again. That's all it is. That's what it's all about." Mike Pence: It was a quick trip to the voting booth for Donald Trump's running mate on Tuesday. Indiana Governor Mike Pence was joined by his wife, Karen, as they voted in Indianapolis. The couple encountered no lines and spent about five minutes filling out their ballots. Pence told a small crowd afterward that he was grateful for the "support and prayers of people all across the United States" and he pledged a more prosperous America with the Trump-Pence ticket. Pence and his wife voted in a precinct that has leaned liberal in past elections. Watch as Gov. Mike Pence casts his vote in Indiana.